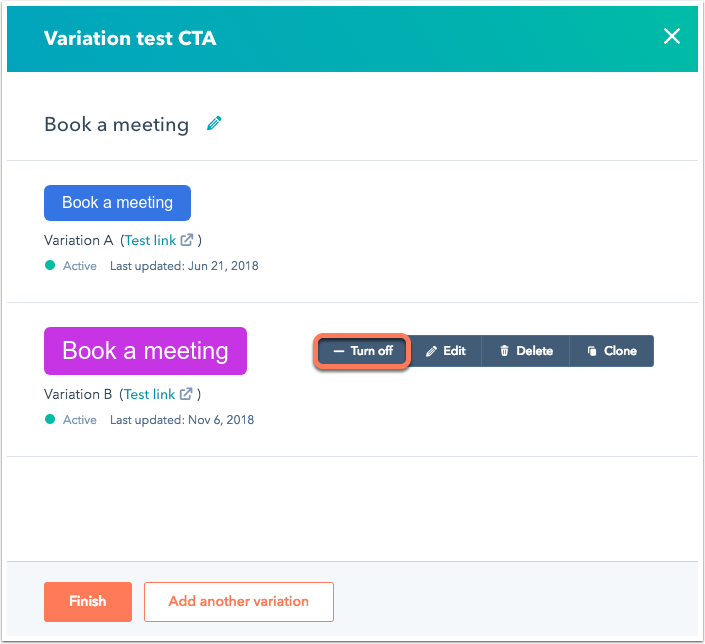 You can run an A/B test with multiple variants of your CTA to help measure the effectiveness of different designs and text. 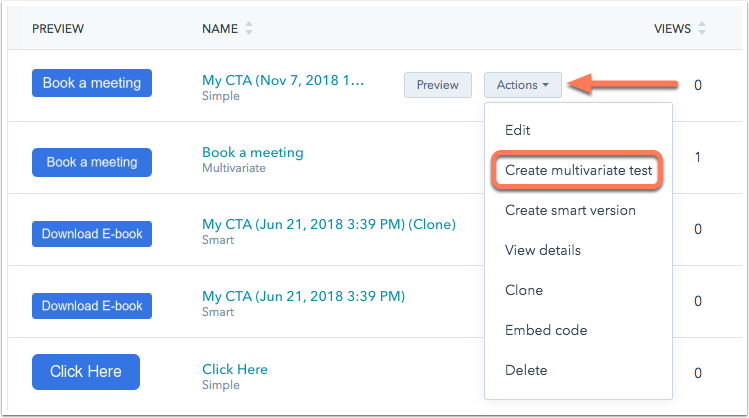 Hover over the CTA you want to create a multivariate test for and click the Actions dropdown menu, then select Create multivariate test. In the slide-in panel, edit the CTA variant. 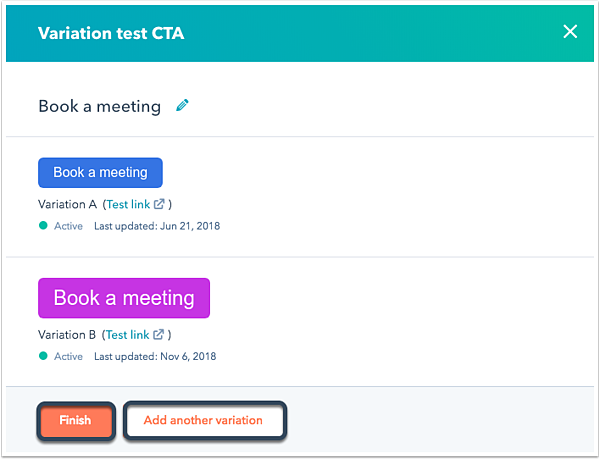 Please note: when running an A/B test, it is recommended to only change one variable between versions so that you can more easily determine which factor caused more visitors to click on the CTA. Set up your CTA options. Click Finish or Add another variation if you want to test more than two versions of this CTA. You will now see the original CTA labeled as a Multivariate on the dashboard. 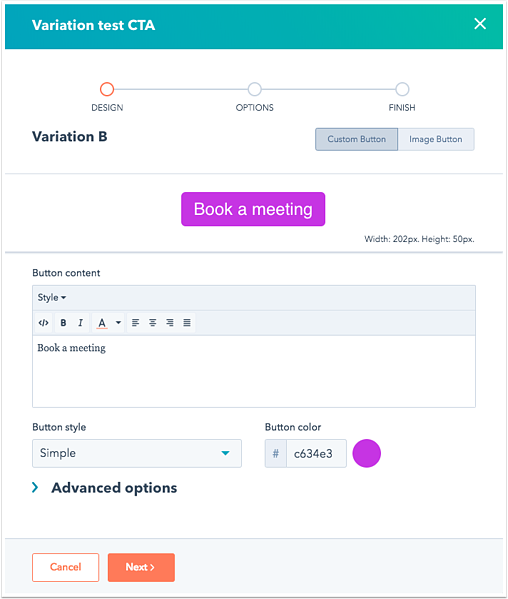 Hover over the CTA and click Preview to view all variations of this CTA. You can view the results of your test on the CTA's details screen. Hover over the multivariate CTA and click the Actions dropdown menu, then select View details. Once you have gathered enough results to achieve statistical significance in your A/B test, you will see a banner alert at the top of the details screen. If a winning variant has been identified, click Only show this version so only the best performing variant will display. If your test is still running, you can track the performance of each variant over time. Click the Show dropdown menu to filter your chart visualization by clicks, views, or submissions. Use the Date Range dropdown menu to analyze the CTAs performance across a specific time range. Below the chart visualization, view a count of total clicks, views, and submissions over the specified time range. At the bottom of the details screen, view a breakdown of each variant's performance. To sort your data by a specific metric, click on that column heading. Click a content type in the top-right corner to see a detailed breakdown of that variation's performance by specific content types. Hover over the multivariate CTA and click the Actions dropdown menu, then select Edit. In the slide-in panel, hover over the variation you want to disable and click - Turn off. To completely delete the variation, click Delete. Then click Finish.